Times change, trends come and go and a perfect example of that is the shift in family transportation over the last few decades. From the good old station wagon to the minivan and now the SUV, the ways most families get around has changed considerably in a matter of a few years. Even though the principals of safety, comfort and convenience will always be main factors in choosing transportation for the family, the way those elements come together never remains the same for long. The constantly changing transportation industry has made room for bikes—and so has infrastructure in many cities, but up until fairly recently, trading in a car for a bike only made sense for people without kids and those who could manage to travel light. The invention of cargo bikes has pushed limitations and recent advancements are making a completely human-powered transportation lifestyle more feasible than ever before. Bike Friday is one such company pushing the limits with their latest cargo bike, the Haul-a-Day. 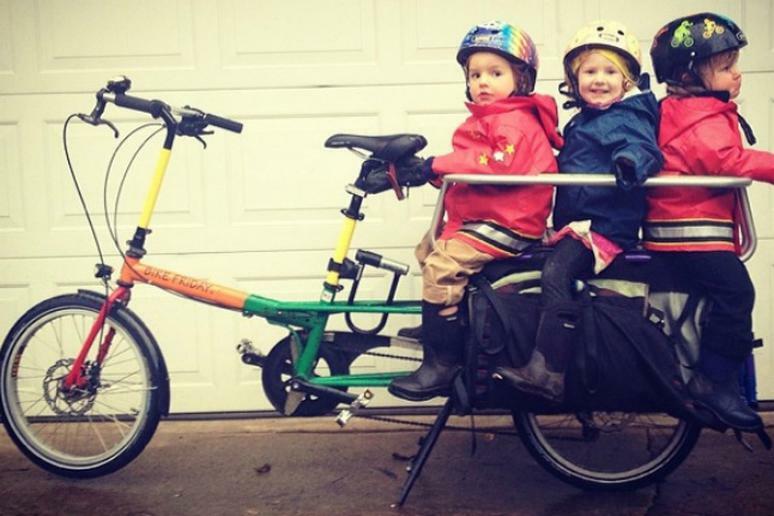 The lightweight, adjustable cargo bike is versatile and easy for anyone in the family to use. The seat and handlebars adjust to fit riders between the heights of 4’6” to 6’4” and starting at just 32 pounds (usually cargo bikes start at around 40 to 50 pounds), the Haul-a-Day is light enough for almost anyone to maneuver. The bike is far more adaptable for shorter and lighter riders as opposed to other cargo bike models. The standard model of the Haul-a-Day holds up to 200 pounds of cargo and the upgraded frame holds up to 300 pounds; the rack is customizable as well. The Haul-a-day has two 20” wheels, shifting the center of gravity lower than normal—this helps maintain a more stable ride. The main tube on the main frame has a, “low step-over height,” making it easier to mount and dismount the bike, which is especially helpful when you’re transporting heavy items. The bike features easy acceleration from a complete stop and fits on most transport racks for cars and busses. Each Haul-a-Day bike is custom made with a choice of 14 different colors, handlebar style and options of equipment and gears that span from 8 to 72 speed variants. Bike Friday is currently crowdfunding Haul-a-Day on Kickstarter, with the goal of $45,000 to aid in production. They have surpassed their goal, breaking $100,000 with time still remaining on their fundraising campaign. You can order your Haul-a-Day cargo bike from bikefriday.com. The prices range from $999-$1,999 depending on your modifications.